I took a few days off from stamping this week during my "staycation" to wrap up my final projects for an almost year long graduate certification program I've been enrolled in since last September. This card for the current sketch at Freshly Made Sketches was my "warm up" card when I sat back down at my stamping table after my time away. I kept things simple, stamping up 4 red apples using Reverse Confetti's Class Act stamp set. The apples were die cut, then arranged on a celery card base that I'd stamped with the set's stem image. 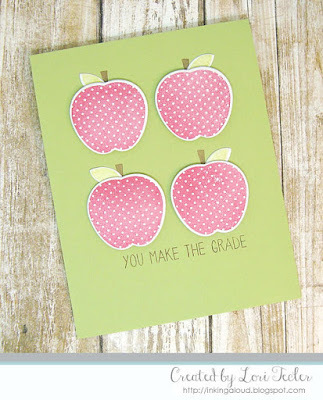 I tucked a single green leaf underneath the top of each apple, then finished the card by stamping the "you make the grade" sentiment beneath the apples in brown ink. Love this card! Those apples are perfect and I love the sentiment! Thanks for joining us this week at Freshly Made Sketches! Just perfect - four bright little apples on a cheerful green background! Thank you for playing along with us at Freshly Made Sketches.